There is a strong movement amongst consumers these days that buying organic food is the most important health issue of the day. 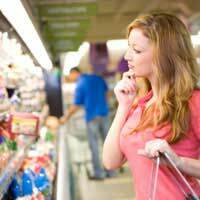 A shopper interviewed for this article, when asked why she chose organic food, replied: " because I want to know what's going in my body. I want food grown and raised without the use of pesticides." Consumers are aware of current Government campaigns recommending that everyone eat at least 5 portions a day of fruit and vegetables a day, in order to absorb the correct daily amount of nutrients and vitamins, derived from plant and fruit sources. But what is less well-known is how the fruits and vegetables available actually contain less nutrients and vitamins than 20 years ago, because they are grown in conditions that use more chemicals, both in the soil, and sprayed directly onto the plant, and these chemicals kill or damage the structure of the plant. It is thought that in order to really reach the recommended daily allowance (RDA) about 10 portions of fruit and vegetables are needed per day – if they are produced in the regular, non-organic way. Who eats that amount of vegetables a day? Intensive agriculture is actually damaging the crops that are grown: chemicals in the soil can linger for many years, damaging it for many years to come, and acting as a storehouse of poisons and toxins. This is not to mention further environmental damage caused when these chemicals leach into water supplies, and are consumed by wildlife. The Soil Association, a UK-based organic certification body and campaigning ground for organic farming, say that a product needs to contain a minimum of 95% organic ingredients (excluding water and non-agricultural ingredients) to be called organic. The movement for organic foods has grown so rapidly in the last 10 years that this fact alone might show there is some truth in the claim that food produced in this way both tastes better, and results in healthier bodies. Ultimately, this is up to each individual to compare products, both grown organically and those grown non-organically. Fruits and vegetables are easy to compare, require little preparation – though do wash any fruit or vegetable that has been grown non-organically, as per seller's instructions on the packaging, and should provide instant taste differences on the palate.Organic foods are grown without pesticides and chemicals, which must be better for our bodies as well as our taste buds! The UK has a long tradition of organic agriculture – originally, nothing was grown with chemicals. Now that the market exists and is constantly expanding, organic food is available everywhere, from exclusively organic cafes and restaurants, to special organic produce aisles in every supermarkets, to farmer's markets, which generally sell mainly organic. Check with your local shopkeeper: if there isn't a range of organic food available, persuade him or her that they should sell it. Your money counts! Many people who eat either exclusively organic food, or are trying to increase its place in their diet, say that they feel an increased vitality and healthfulness knowing that the food they eat is really good for them, and contains the pure vitamin, mineral, and fibre content that the body needs. It’s surely time for everyone to try this for themselves.